Planning your retirement involves far more than determining how much income you’ll need. One of the most basic and important decisions is where you want to live during your retirement years. Choosing a location is something you can start working on early, as much as five to 10 years before you leave work. Don’t wait until retirement is just around the corner, because the process of comparing and contrasting different regions can be time-consuming and eye-opening. The first step is to decide whether you want to remain where you are or move to a new place. It’s a very personal starting point, and often it will take into account proximity to family members and attachment to your community. Discuss your desires. Do you dream about lying on a beach with the latest bestseller, or reeling in giant marlin from deep water? Do you envision attending symphonies and plays, or riding horses and hiking up mountains? Will you play golf or visit museums and the library? Do you want lots of sunshine or four seasons? Small town or big city? Lots of restaurants or lots of bait shops? Start by writing down a clear picture of your life in retirement. Do your homework. Start matching real places with your dream retirement activities and environment. Look into weather, demographics, health care costs and health care availability for hospitals and medical specialties, crime statistics, and other factors using popular “Best Places To Retire” guides. Generate a list of three or four places that look like good matches. Dip your toe in. Schedule a trip to each area, and make it a long vacation if possible, up to several weeks. Try to visit each area at different times (e.g., when weather isn’t ideal) and experience as many things as you can while there. Are the people friendly? Do any unexpected difficulties pop up? Does it match your vision? Consider longer visits. If your short-term visits leave you uncertain, consider renting your current home out while you spend even more time in your potential locations. Take several months to get a real feel for the area and make your decision. After all, you hope to live there for a long time to come! Once you decide on a location, it’s time to look at some financial factors, starting with the sale of your current home. Ask several realtors for an estimate, and compare what you’re likely to clear from the sale with what you’ll need in your new area. We can help you do these calculations, and we’ll add any expected surplus into your income calculations, and take into account tax and other implications. 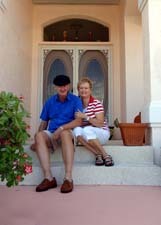 Relocating can be one of the most stressful aspects of retirement. Work with a financial advisor who understands all the state and estate tax implications and how moving affects your financial outlook and quality of life.